A big part of fishkeeping is adding water to your aquarium. Whether it’s filling a new tank or performing a water change, you need a reliable and safe source of aquarium water – the lives of your fish depend on it! Today, I share with you all the different sources of water you can add to your tank, as well as the pros and cons of each. By the time you finish reading, you will know exactly which water source is best for your tank. Whatever water you decide to fill your aquarium with, test it first! You see, water quality is the number one deciding factor in whether your fish live or die. While you cannot see it, your water actually contains many different salts and elements dissolved in it. Some of these are good. Others are dangerous and can kill your fish. Fish can adapt to less-than-ideal water conditions. However, it does negatively impact their health and happiness. For example, your fish may not live as long or refuse to breed. Part of your job as a fish keeper is to monitor these levels in your water and make adjustments as necessary. Unfortunately, you won’t know what’s in your water until you test it. Don’t worry! Testing is quick and inexpensive. You can do it yourself with an aquarium test kit. I recommend grabbing an API Master test kit. It contains almost everything you need to perform these tests. Now, there are three others you should test. However, the ideal levels of these vary according to what you keep in your tank. Don’t stress if you test your water and find that the levels are not ideal. Many products are available to improve the water quality. For example, you can use Purigen to remove ammonia or an alkalinity buffer to increase KH. All water sources require some preparation on your part to make it safe for your fish. The results of your tests will guide you on how to make your water safe or whether you should choose a different water source altogether! With that out of the way, let’s look at the different sources of water you can use in your aquarium. FishLab Tip: Want to do less water preparation? You may be able to choose a species of fish that will happily live in the parameters of your water source. 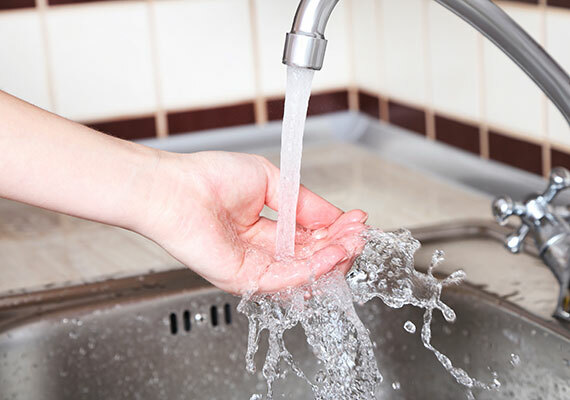 Simply turn on your faucet, and you have as much water as you need – it’s cheap and readily available. After all, you are already paying the water bill. Why make life harder by using a different water source if you don’t have to? 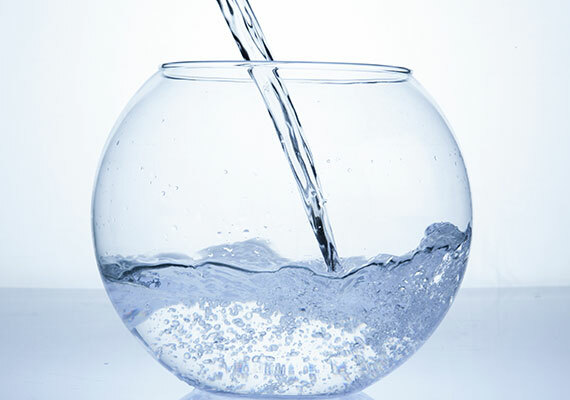 The good news is, for the majority of you, tap water is all you need to fill your aquarium. Just one problem. Tap water quality varies according to where you live. We all know what happened with the Flint water crisis! Ask your local fish store! Any fish store in your area will have used local tap water for years. If anyone has advice for using tap water to fill an aquarium, it’s these guys. Okay, so your tap water is safe to use? Your local water supply adds chlorine or chloramine to the water to make it safe to drink. These disinfectants kill bacteria and other microbes. Chlorine, however, doesn’t differentiate between good bacteria and bad bacteria. It destroys it all. You see, bacteria live inside your aquarium filter. Good bacteria. In fact, the entire reason you cycle your aquarium is to introduce these good bacteria. If these beneficial bacteria die, then the water will soon turn toxic to your fish. So, before you add tap water to your aquarium, you must first dechlorinate it. Fortunately, this is as simple as adding a water conditioner to your aquarium. 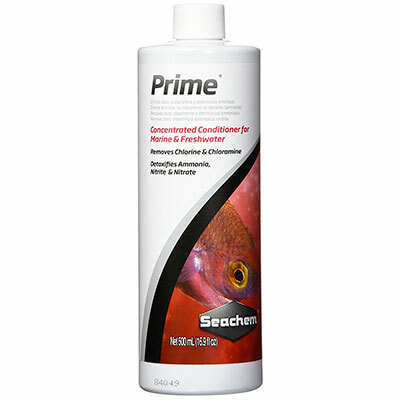 I personally recommend Seachem Prime. Not only does Prime dechlorinate your tap water, but it can also be used in an emergency to detoxify ammonia, nitrite and nitrate. If you have a freshwater aquarium, keep a bottle of this on hand at all times. Well water is untreated groundwater that is piped into your home. It can be hit or miss whether your well water is suitable for your aquarium. Unlike tap water provided by your local water supply, the government does not test the quality of well water. 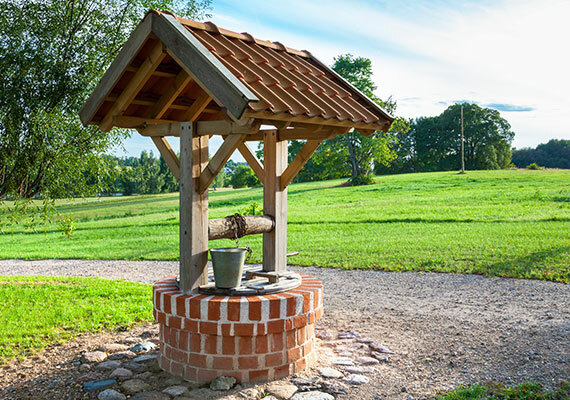 The exact properties of your well water entirely depend on where you live in the country. For example, states like Florida and Arizona have very hard groundwater while states like New York and Colorado have very soft water. Especially if you live in a rural area where there are lots of farms. When it rains, fertilizer can wash into the groundwater and contaminate it with phosphates and nitrates, which can lead to problems in your aquarium. So while you may have to harden or soften your well water, at least you won’t have to dechlorinate it – well water is chlorine-free. I’d only recommend well water if you plan on testing it regularly. Set up a reverse osmosis (RO) system under your sink, and you’ll have pure water on demand. To put it simply, RO works by forcing water through a super fine filter called a membrane. The holes in this membrane are so fine that only nearly pure water can make it through. Minerals, chlorine and even many bacteria are too large to make their way through the membrane. Reverse osmosis is capable of removing 90-99% of contaminants from water. Purified water comes out one line while the leftover wastewater exits through another. Reverse osmosis is so effective that it will also filter out minerals and elements from the water. Even those you want to keep – the trace minerals that are essential for osmoregulation in healthy fish and a stable pH. Fortunately, many products are available that help add the good stuff back to your RO water. In a freshwater tank, use a remineralizer like Seachem Equilibrium to restore the mineral balance. In a saltwater tank, your salt mix adds the essential salts and elements to the water. 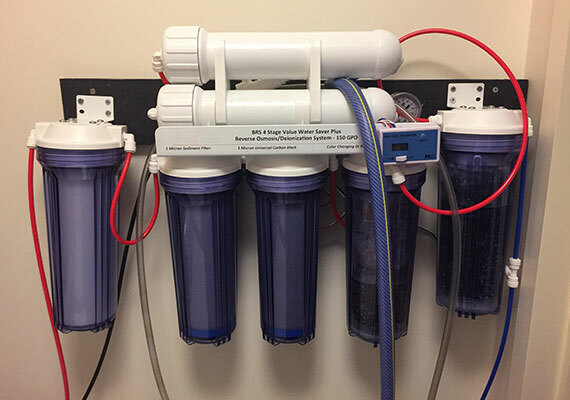 A reverse osmosis system ranges anywhere from $50 to $300. The filters need to be replaced periodically, however. Hard water may require replacing the filter every 6 months, while those with soft water can get up to 2 years of use before replacement. 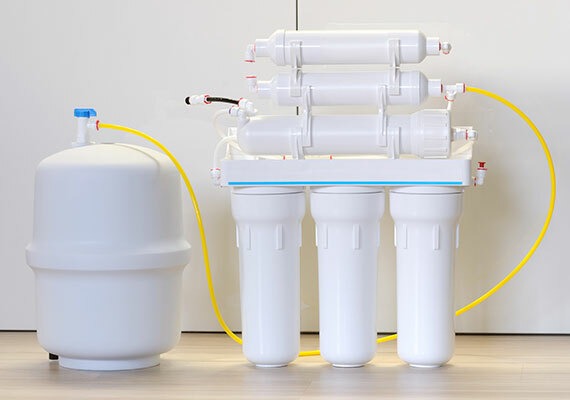 A deionization unit is another device you can connect to your plumbing to achieve pure water. Deionization works a little differently than reverse osmosis. A deionization unit contains filters filled with a chemical resin. The science behind these chemical resins is both impressive and complex. To put it super simply, the resin attracts and traps contaminants and exchanges it for the ingredients needed to create pure water. Deionization units remove both minerals and even man-made chemicals such as pesticides from the water. The downside with DI systems is that they cannot remove bacteria or sediments from your water. However, when used correctly, a deionization system can eliminate the 5-10% of contaminants that a reverse osmosis system cannot. Just like reverse osmosis, deionized water needs to be remineralized before being used inside your tank. What if you could get the benefits of both reverse osmosis and deionization in a single device? Well, it turns out you can. An RO/DI system takes advantage of both filtration methods. The result is water that is considerably more pure than using each technique individually. The result is the purest water possible, created right in your own home. RO/DI units are commonly used for reef tanks, where even minor levels of contaminants can upset sensitive corals. 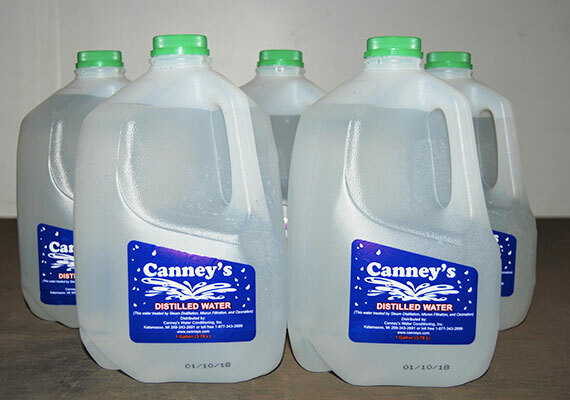 If you only occasionally need purified water, distilled water may be a better option. Distilled water is made in an industrial setting by boiling water to produce steam. As the water is boiled, it kills off bacteria. As the steam rises, it leaves behind impurities, such as chlorine and minerals. The steam is then cooled, turning back into pure water. The water is then collected and sold as distilled water. Found on the shelf of your local grocery store, you can pick up a gallon of distilled water for under a dollar. The only downside to distilled water is that it’s not practical for larger tanks. While distilled water is darn cheap, you’ll need an awful lot of it to fill a 50-gallon tank. Just like with the previous pure water sources, you must remineralize distilled water before adding it to your tank. Bottled water is great for drinking on a hot day, but it may not be the best solution for your aquarium. Purified water – Tap water that goes through an RO/DI system or distilled. Filtered water – Tap water that goes through various filters such as charcoal to improve taste. Spring water – Water that is collected underground. It may or may not go through additional filtering. Each of these results in water with different parameters. 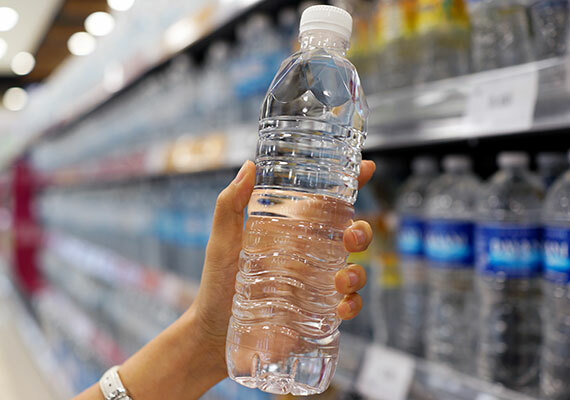 So, you need to test your bottled water carefully before deciding how to adjust it. For example, some bottled water still needs chlorine removed. And because bottled water is designed for us to drink, it is often considerably more expensive than just using distilled water. I only recommend using bottled water in an emergency, when nothing else is available. Another alternative source for aquarium water is to collect rainwater. Rainwater has a low pH and almost no mineral content, so it requires modifying on your part before it is suitable for aquarium use. All you need is a large barrel or storage tank, and you are set. 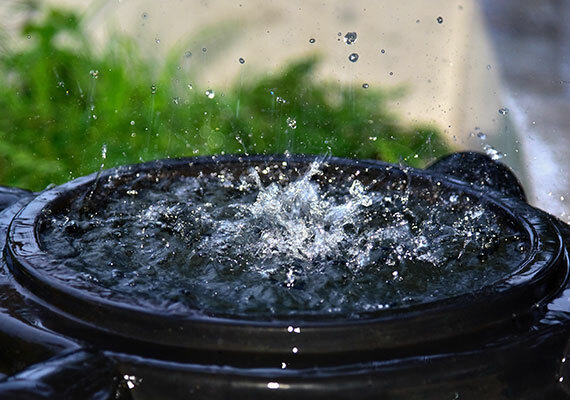 Be mindful of the few downsides to using rainwater as a water source for your aquarium. First, you need it to rain. That makes this solution unsuitable for those living in a dry state like Nevada. If it doesn’t rain frequently, then you risk running out. It is for this reason that you should always have a backup water source just in case. If the water is collected from the roof, then it may contain runoff such as asbestos, sand or grit from the shingles, not exactly aquarium-safe water. It’s also easy to end up with leaf litter and other gunk floating in the water. And if you live in a big city, then your rainwater could actually be contaminated from air pollution. Finally, mosquitos may lay eggs in your water barrel. While mosquito larvae may make an excellent meal for your fish, your neighbors won’t appreciate them when they turn into adult mosquitos. Phew… If you can overcome all that, then rainwater can certainly be used as a water source for your aquarium. 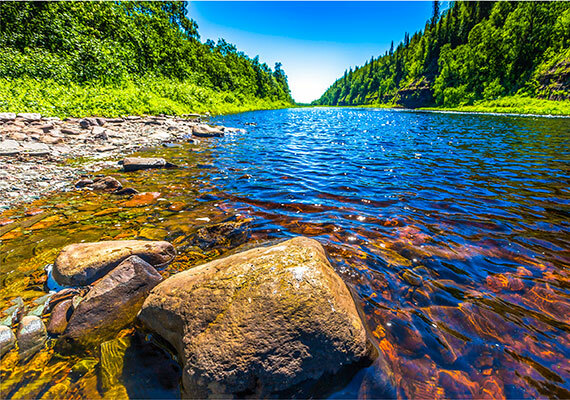 Have a stream, river or lake nearby? You may be tempted to collect water from it for your water change. I mean, you can see fish living in it, so the water must be safe, right? In fact, this is basically the only water source I do not recommend. First, the fish you see in these rivers have had many, many generations to adapt to the conditions. The fish in your tank are used to very different water. But perhaps even more worrying, many waterways in the US are shockingly polluted. 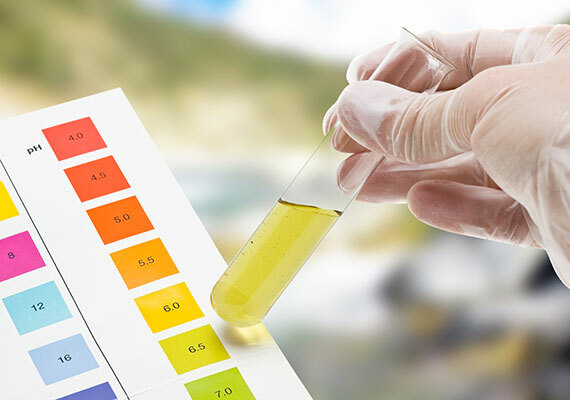 The waterway may look clean, but it may contain toxic industrial and agricultural chemicals – none of which will be detected by your basic aquarium test kit. While tests that can identify this pollution are available, they are prohibitively expensive. Finally, waterways contain fungi, bacteria, viruses and parasites. Your pampered fish are not prepared to do battle with these nasties. Water is darn heavy. Do you really want to haul water back to your house every time you perform a water change? Using water from rivers, streams and lakes can be dangerous to your fish. If you made it this far, then you’ll have a much better idea of which water source is best for your tank. I’ll say it again. Water quality is the single biggest factor in whether your fish live or die. And, choosing an appropriate water source can make maintaining water quality much easier. Which water do you use to fill your aquarium? Let me know in the comments below! Can irrigation water be used for freshwater tanks with proper conditioning? Probably not. If we are talking about the run-off, It would have all sorts of chemicals from fertilizer and bug sprays. Recently (2x already) I started leaving my goldfish in the tank as I complete the water change. Is this harmful to them? I add Safe Start when I begin filling with new water. They’re still small and figured it is easier than trying to catch them, and making them scared and stressed out. What should I do? You are not expected to remove your fish when you perform a water change removing them will stress them out much more than leaving them in. However, you would ideally add the dechlorinator to the replacement water rather than the tank itself. I mix 25 gallons of tap water with 5 gallons of reverse osmosis water and pump it into my tank. That’s a great way to soften your water! I am Piyush from Maharashtra, India. keeping fish from 20 years, I am using Tap water with dechlorinate liquid from local pet shop it is very cheap only 1 drop is enough for 1 gallon water. In our area there is no 24 hours water supply, we get only 1 hour water supply in two days. So I am thinking on recycle aquarium water using Water Lettuce and water hyacinth, is it possible to recycle Aquarium Water at home ?? Are you talking about for drinking? Or to remove nitrates from the water? I have no experience on drinking and cannot comment. As for creating a tank where water changes are not needed, it certainly is possible. The biggest issue is removing nitrates and remineralizing the water so that fish can effeciently osmoregulate. If this is what you are after, you could read up on the walstad method. It’s quite a balance but it certainly doable. Read my bubbles guide for causes of bubbles. It’s likely the first solution, as a result of filling your tank. Did you cycle your tank before adding your fish? If not, read my fish-in cycle guide.